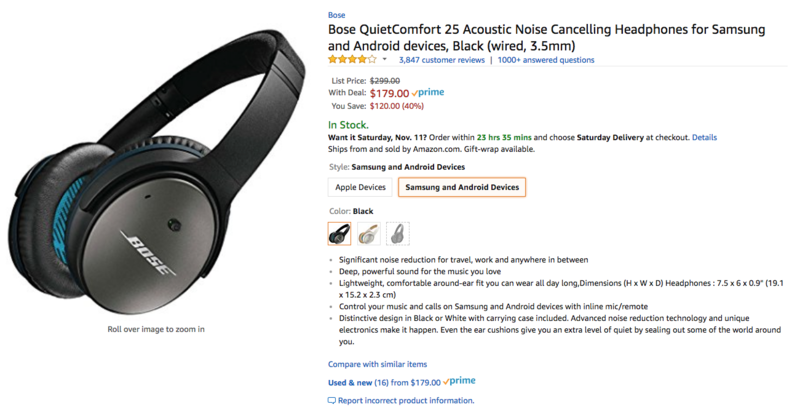 Bose's beloved QuietComfort 35 may already have a successor, the QuietComfort 35 II, but the company has still been selling the wired QC25 for quite some time. At $279, it appeals to a slightly different market than the $349 QC35 (II). But for the impending Black Friday deals, the company has dropped prices by $100 to just $179 at quite a few retailers. The QC25s are a great set of headphones all around. Sound is great, Bose's noise cancellation is fantastic, and comfort is second-to-none. Plus, the included carrying case allows you to bring them with you anywhere. If you fly often and don't like dealing with Bluetooth, these should definitely be considered. Adorama, Amazon, B&H, Best Buy, Fry's, and Newegg all have the QC25 for $179. It's worth noting that these are the Android versions, meaning that you'll be able to use the inline volume controls with no issue. Shop around and see which retailer best matches your shipping/availability needs.